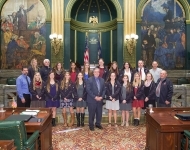 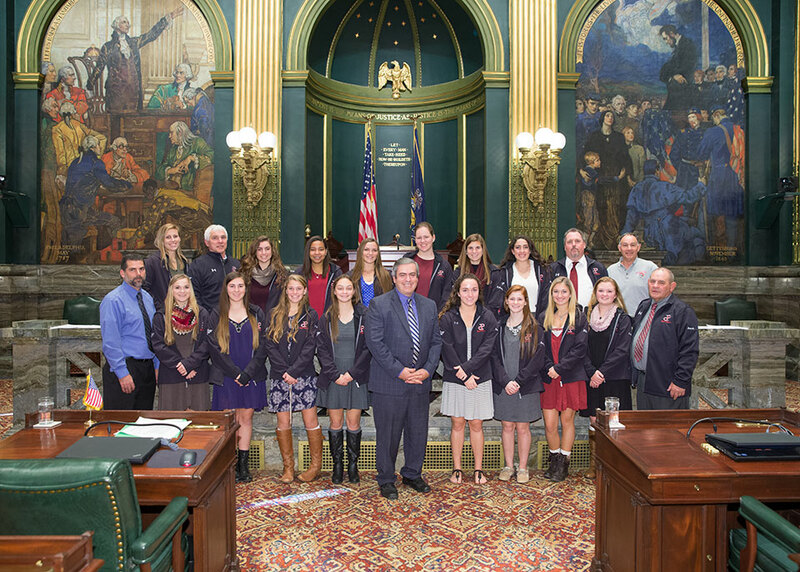 November 16, 2015 – Senator Browne (center) welcomed the 2015 PIAA Class 4A State Champion Parkland High School softball team to the Senate Floor. 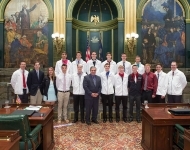 November 16, 2015 – Senator Browne (center) welcomed the 2015 PIAA Class 3A State Champion Parkland High School boys volleyball team to the Senate Floor. 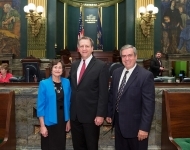 October 26, 2015 – Senator Browne (right) welcomed Pastor Bob Stevens (center) as his guest and to serve as Guest Chaplain of the Senate. 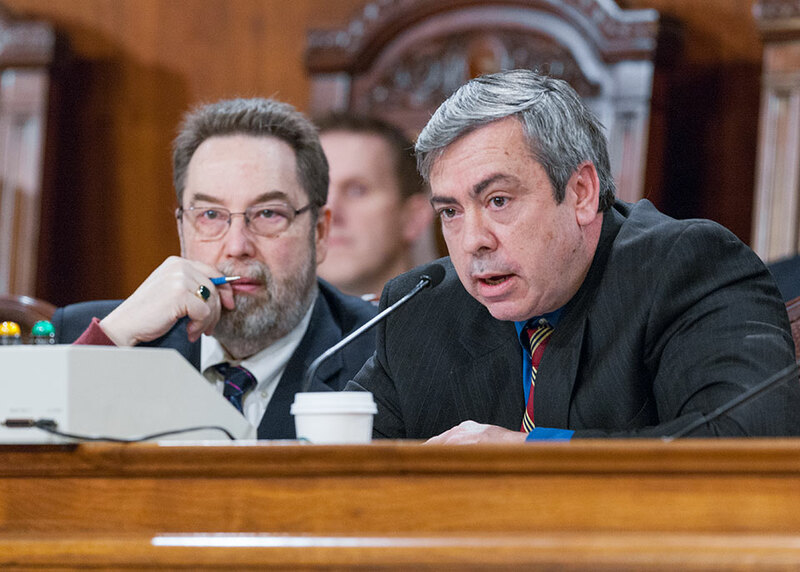 Pastor Stevens is from Zion’s “Liberty Bell” Church in downtown Allentown. 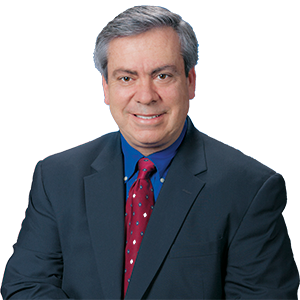 Zion’s is known as the Liberty Bell Church because in 1777, eleven bells were brought there from Philadelphia and hidden under the floor boards of the church for safe keeping during the Revolutionary War. 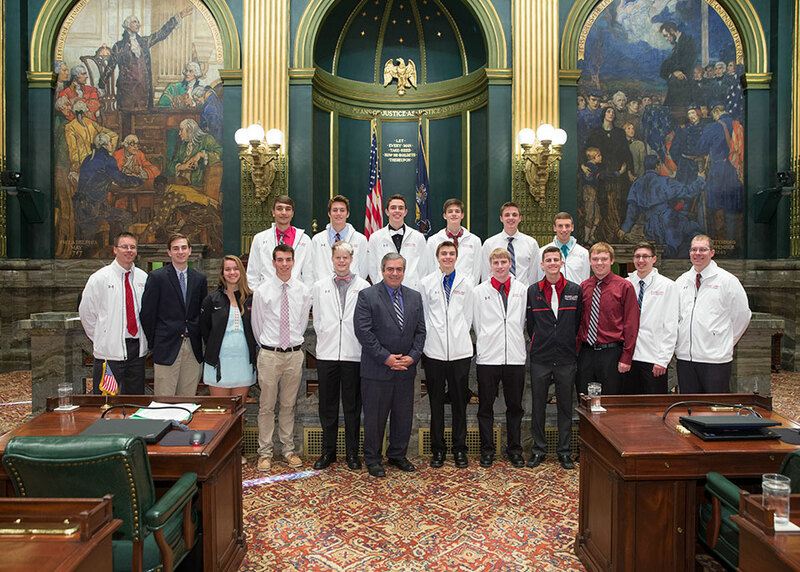 One of those bells is now better known as the Liberty Bell. 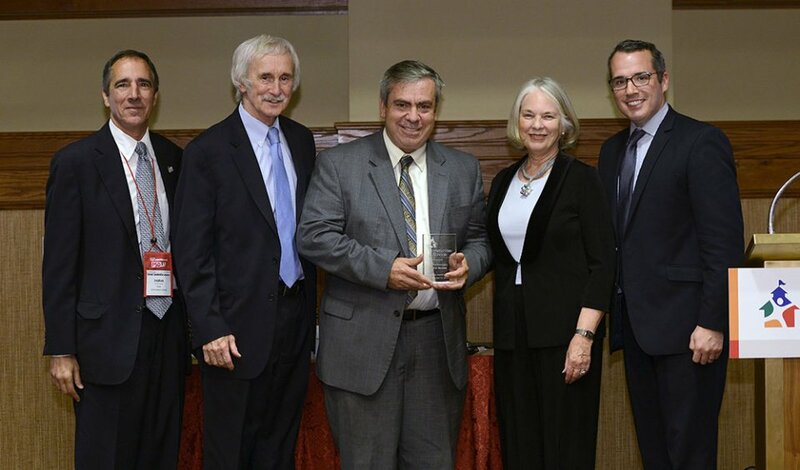 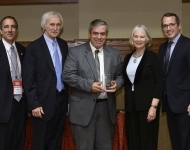 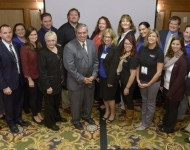 October 15, 2015 – Senator Browne (center) received the Communities In Schools of Pennsylvania’s (CISPA) Milliken Award for demonstrating “consistent leadership and commitment for children in our Commonwealth” during CISPA’s Leadership Conference in Hershey, PA. 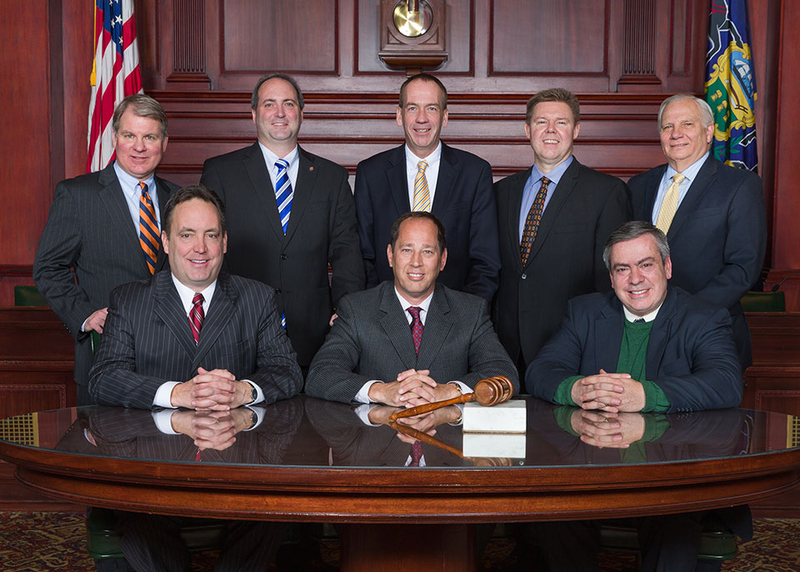 Joining Senator Browne are (left to right): Damian Zamias, Chairman of the Board of Directors of Communities In Schools of Pennsylvania, Bill Milliken, Founder & Vice Chairman of Communities In Schools, Senator Browne, Jean Milliken and Ryan Riley, President & State Director of Communities In Schools of Pennsylvania. 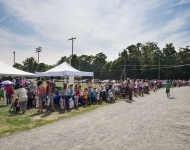 August 6, 2015 – Senator Browne hosted his 10th annual Community and Family Expo at Bucky Boyle Park in Allentown. 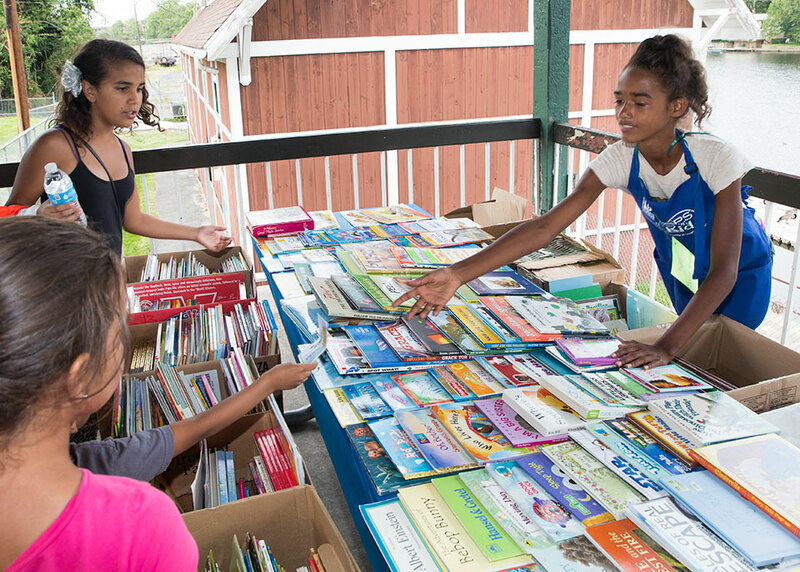 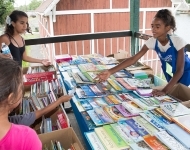 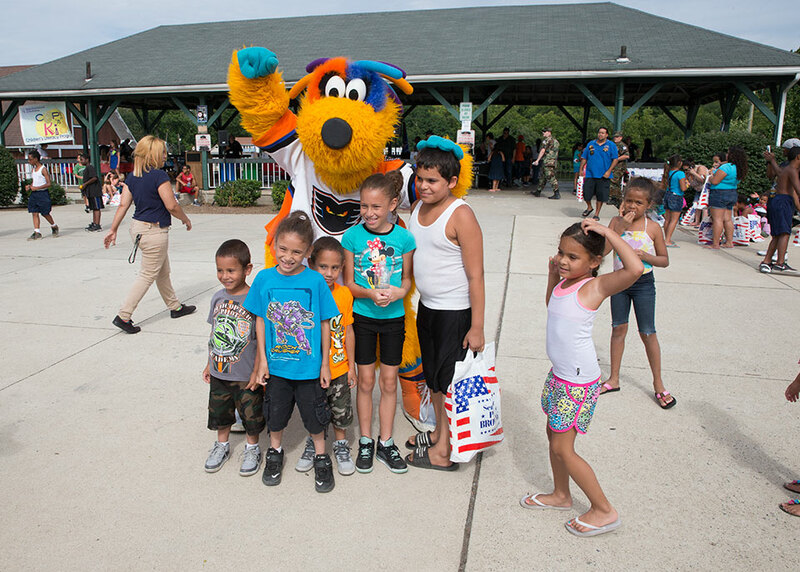 August 6, 2015 – Thanks to Lehigh Valley Cops ‘n’ Kids all children who attended Senator Browne’s 10th annual Community and Family Expo at Bucky Boyle Park received a free book. 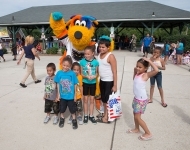 August 6, 2015 – Lehigh Valley Phantoms Mascot meLVin entertained kids at Senator Browne’s 10th annual Community and Family Expo at Bucky Boyle Park in Allentown. 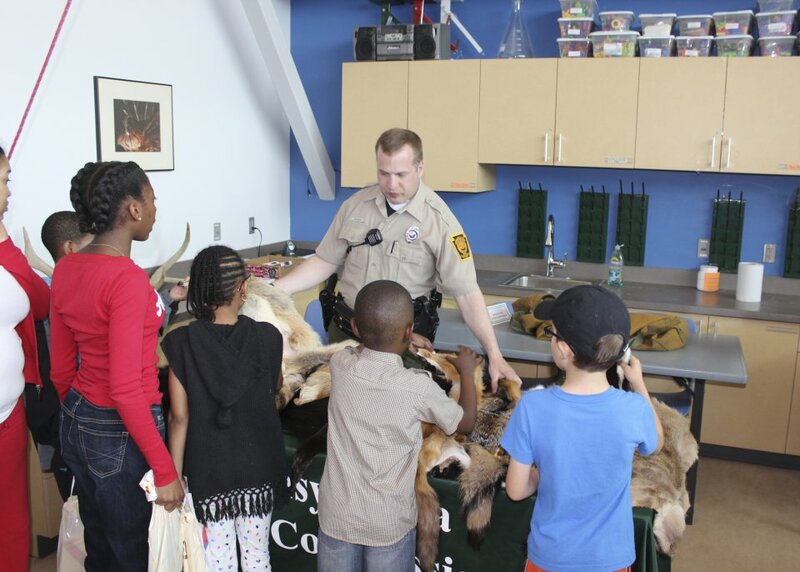 May 9, 2015 – Students learned about different animal skins from the Pennsylvania Game Commission, one of the many exhibitors at Senator Browne’s and Rep. Mackenzie’s Kids Discovery Expo at the Da Vinci Science Center. 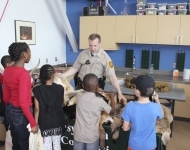 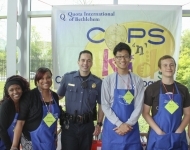 May 9, 2015 – Volunteers with Lehigh Valley Cops ‘n’ Kids handed out books to every kid that attended Senator Browne’s and Rep. Mackenzie’s Kids Discovery Expo at the Da Vinci Science Center. 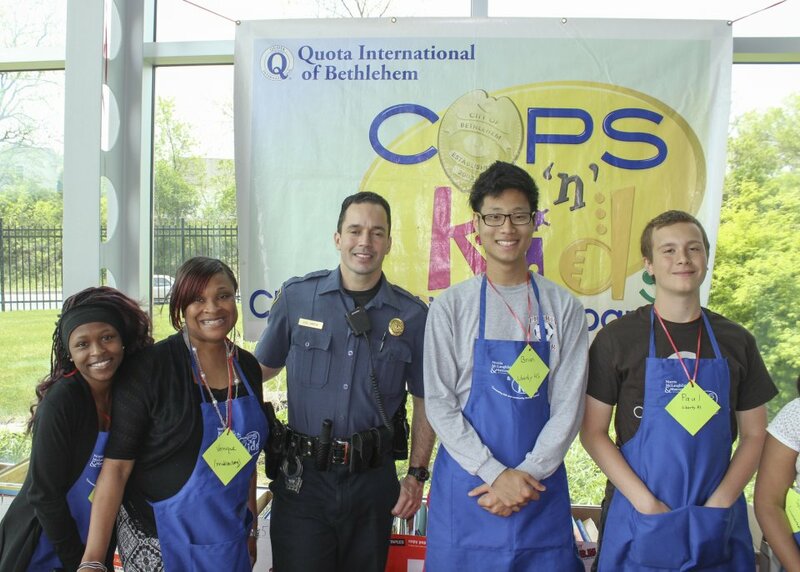 Here they are joined by an officer with the Allentown Police Department for a photo. 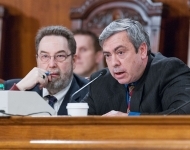 March 24, 2015 – Senator Browne listens to questions and responses during the Senate Appropriations Committee Hearing with the Department of Aging. 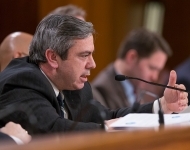 March 19, 2015 – Senator Browne makes a statement during the Senate Appropriations Committee Hearing with the Gaming Control Board. 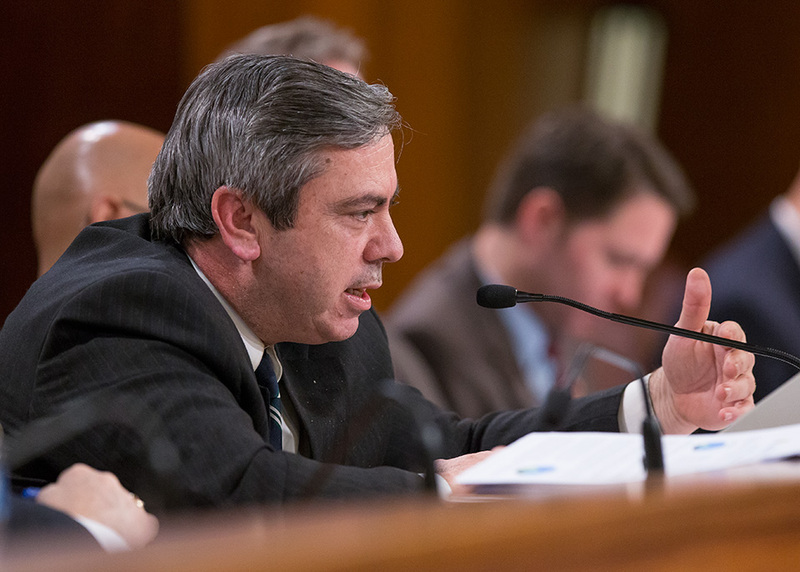 March 17, 2015 – Senator Browne listens to testimony during the Senate Appropriations Committee Hearing with the Attorney General’s Office. 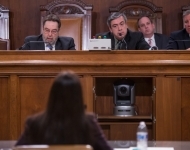 March 16, 2015 – Senator Browne asks a question during the Senate Appropriations Committee Hearing with the Governor’s Budget Office. 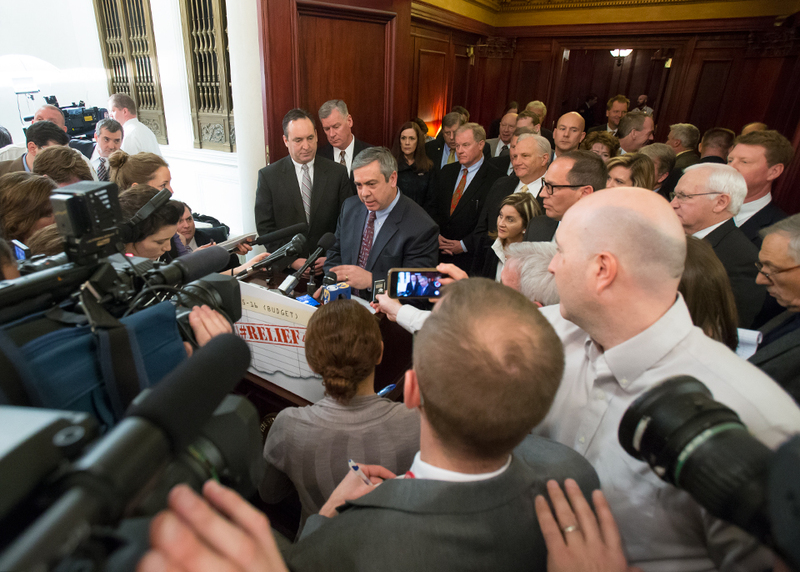 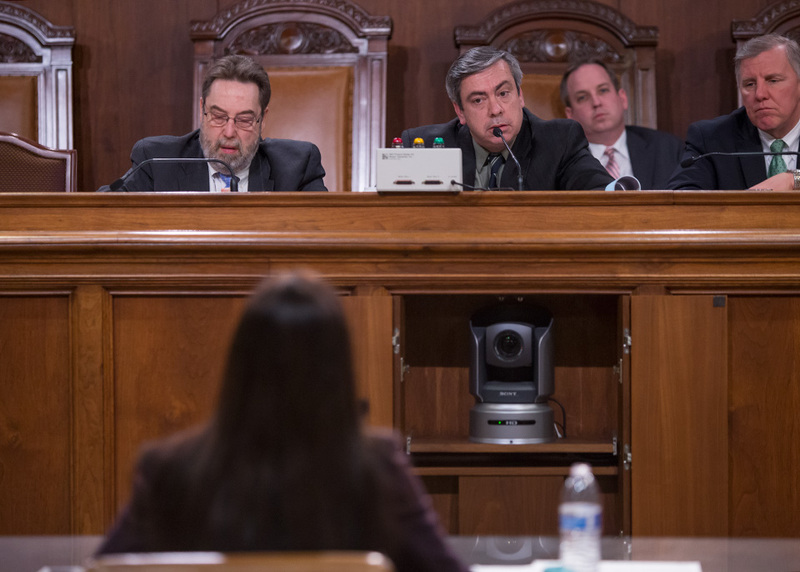 March 3, 2015 – Senator Browne speaks during a press conference in response to Governor Wolf’s state budget address. 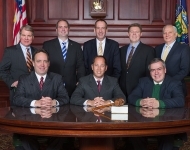 Front Row (Left to Right): Senator Pat Browne (front row, far right) was elected by the Senate Republican Caucus to serve as Appropriations Committee Chairman for the 2015-16 Legislative Session. 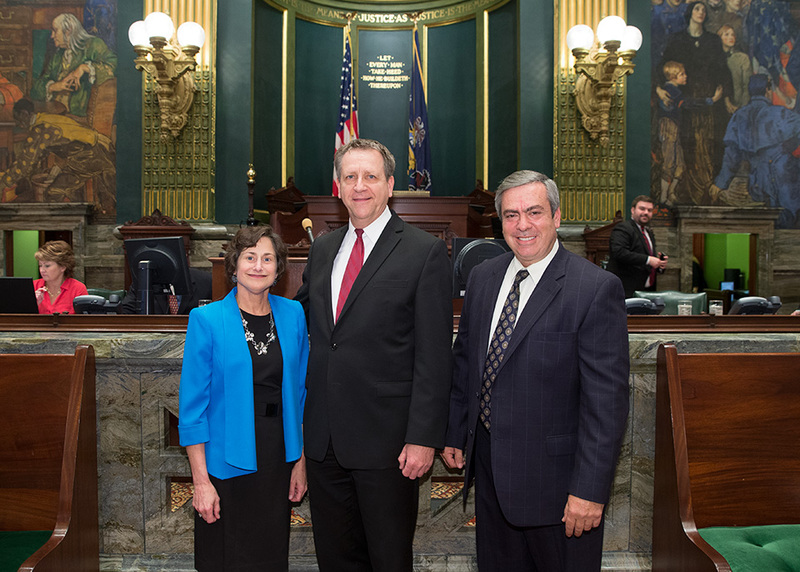 Joining Senator Browne in leadership are: (seated from left to right) Senate Majority Leader Jake Corman, Senate President Pro Tempore Joseph Scarnati, Senate Appropriations Committee Chairman Pat Browne. 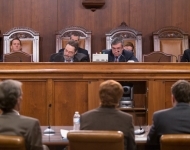 (Standing from left to right): Senate Policy Committee Chair David Argall, Senate Caucus Administrator Charles McIlhinney, Senate Majority Whip John Gordner, Senate Caucus Secretary Richard Alloway and Senate Caucus Chair Bob Mensch. 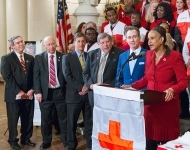 February 24, 2015 – Senator Browne listens to Judge Renee Cardwell Hughes speak during a Press Conference recognizing March as Red Cross Month. 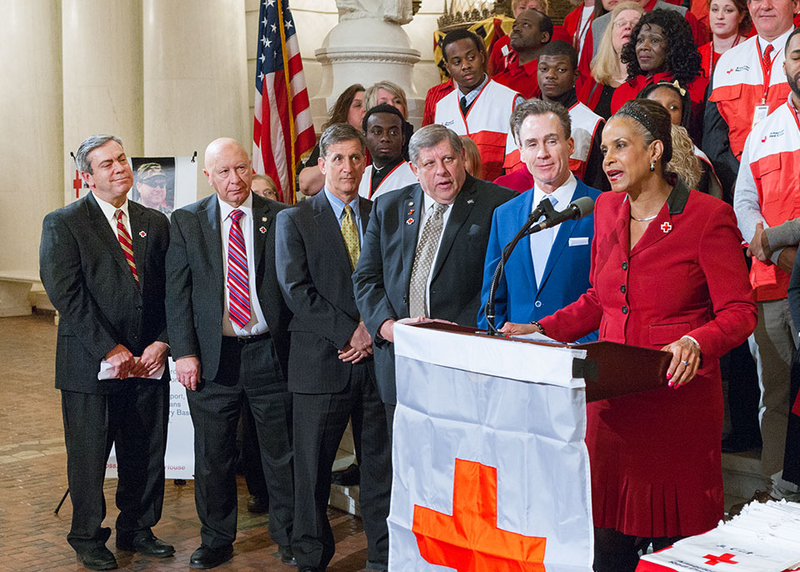 This year, through legislation sponsored by Senator Browne, taxpayers will have an opportunity when filing their State Income Tax Return to support the important mission of the American Red Cross. 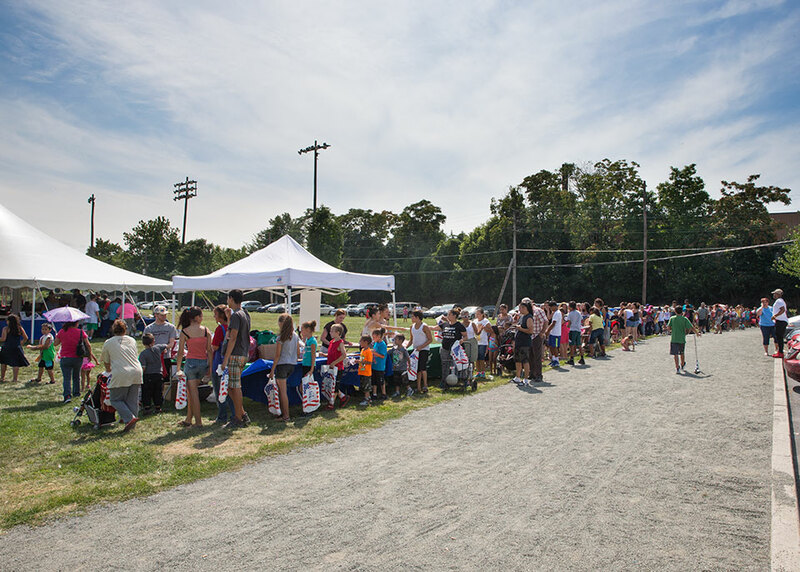 Through a voluntary check-off box on their tax return, a taxpayer can donate part of their tax refund to the American Red Cross to help in its efforts to provide disaster relief to citizens during times of emergencies. 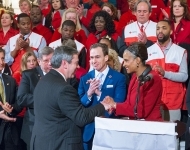 February 24, 2015 – Senator Browne speaks to Judge Renee Cardwell Hughes before giving remarks during a Press Conference recognizing March as Red Cross Month. 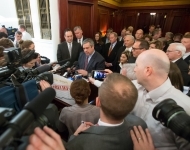 This year, through legislation sponsored by Senator Browne, taxpayers will have an opportunity when filing their State Income Tax Return to support the important mission of the American Red Cross. 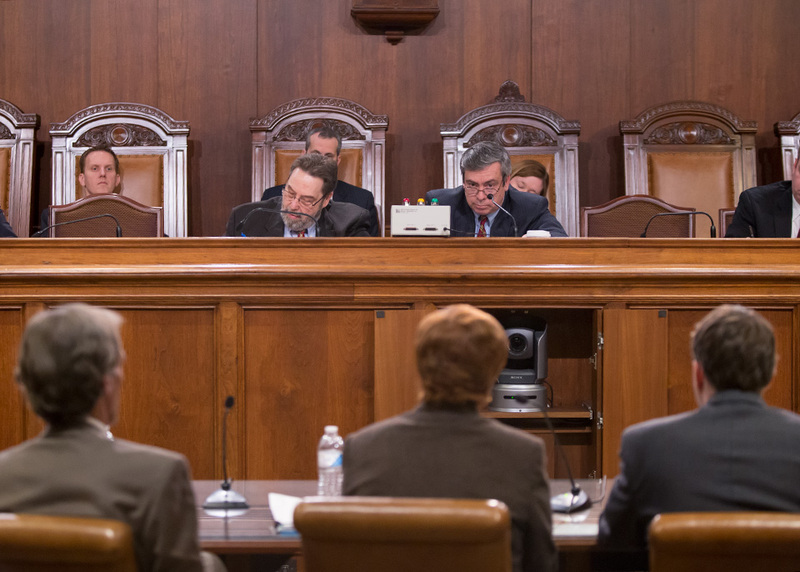 Through a voluntary check-off box on their tax return, a taxpayer can donate part of their tax refund to the American Red Cross to help in its efforts to provide disaster relief to citizens during times of emergencies. 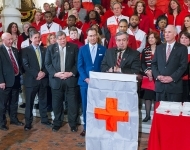 February 24, 2015 – Senator Browne gives remarks during a Press Conference recognizing March as Red Cross Month. 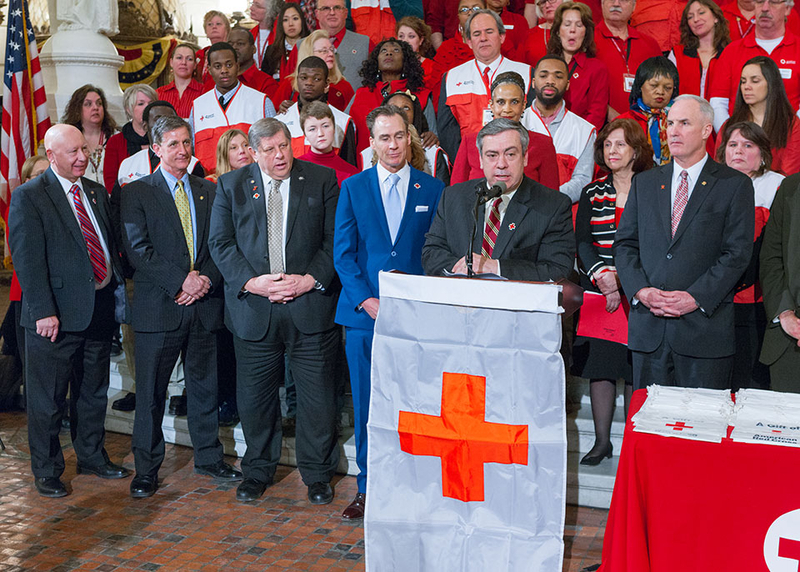 This year, through legislation sponsored by Senator Browne, taxpayers will have an opportunity when filing their State Income Tax Return to support the important mission of the American Red Cross. 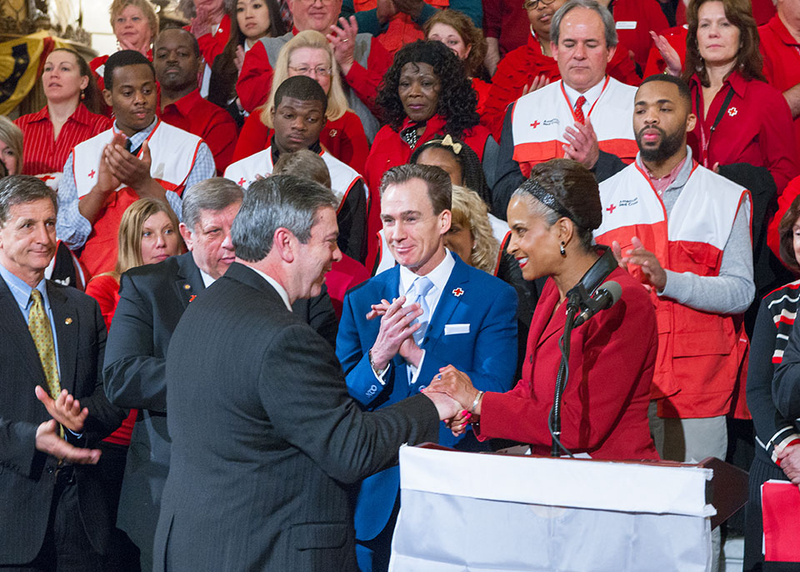 Through a voluntary check-off box on their tax return, a taxpayer can donate part of their tax refund to the American Red Cross to help in its efforts to provide disaster relief to citizens during times of emergencies. 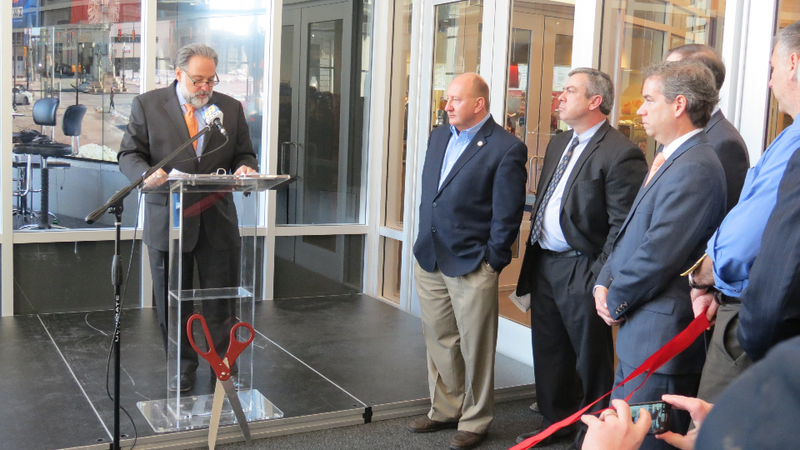 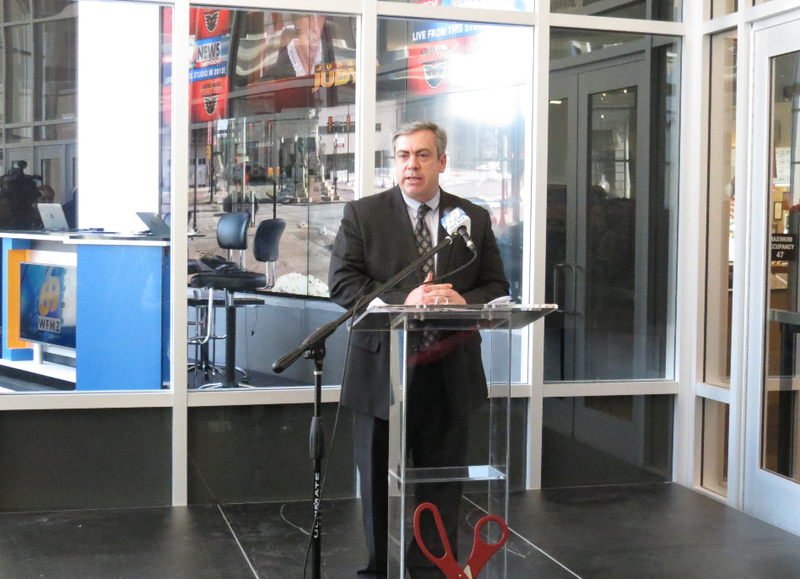 February 20, 2015 – Senator Browne (second from left) listens as Barry Fisher, WFMZ’s president and general manager, speaks during the ribbon cutting and opening of WFMZ-TV’s new studio inside the PPL Center in downtown Allentown. 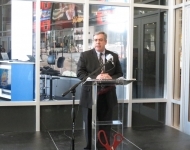 February 20, 2015 – Senator Browne remarks on the continued transformation of center city Allentown at the ribbon cutting and opening of WFMZ-TV’s new studio in the PPL Center in downtown Allentown. 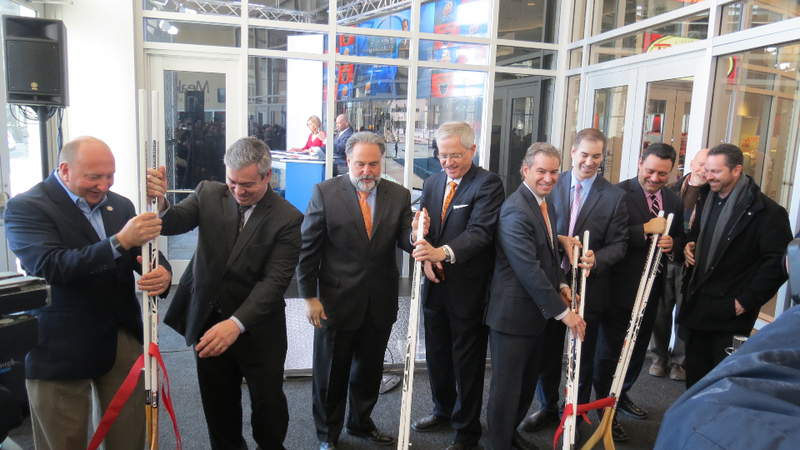 February 20, 2015 – Senator Browne (second from left) helps cut the ribbon during the opening of WFMZ-TV’s new studio in the PPL Center in downtown Allentown. 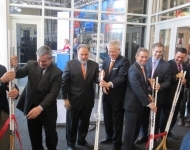 Joining Senator Browne for the ribbon cutting was (from left to right): Allentown Mayor Ed Pawlowski, Barry Fisher, WFMZ’s president and general manager, Rob Vaughn, WFMZ anchor, Rob Brooks, Co-Owner of the Lehigh Valley Phantoms hockey team, Jim Brooks, Co-Owner of the Lehigh Valley Phantoms hockey team, Ed Hanna, WFMZ chief meteorologist, and Troy Hein, WFMZ sports reporter. 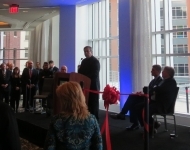 January 16, 2015 - Senator Browne speaks during the grand opening of the Renaissance Allentown Hotel in downtown Allentown. 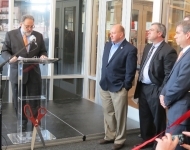 Located at Seventh and Hamilton Streets in Allentown, the hotel is the first full-service hotel to open in the city in 35 years. 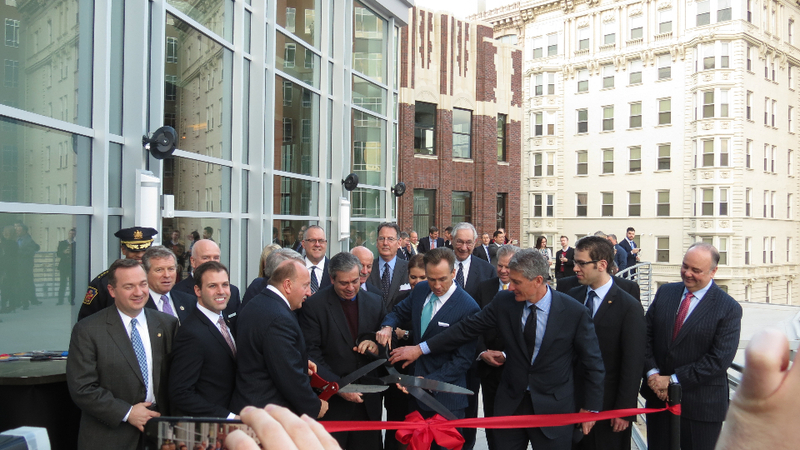 January 16, 2015 – Senator Browne (fourth from left) helps cut the ribbon to open the Renaissance Allentown Hotel in downtown Allentown. 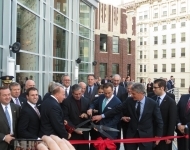 Located at Seventh and Hamilton Streets in Allentown, the hotel is the first full-service hotel to open in the city in 35 years. 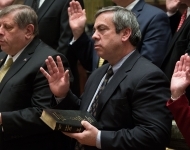 January 6, 2015 - State Senator Pat Browne, R-16, accompanied by his family and staff as well as all members of the Senate and House of Representatives who were elected last November, took the oath of office in the State Capitol today (January 6). 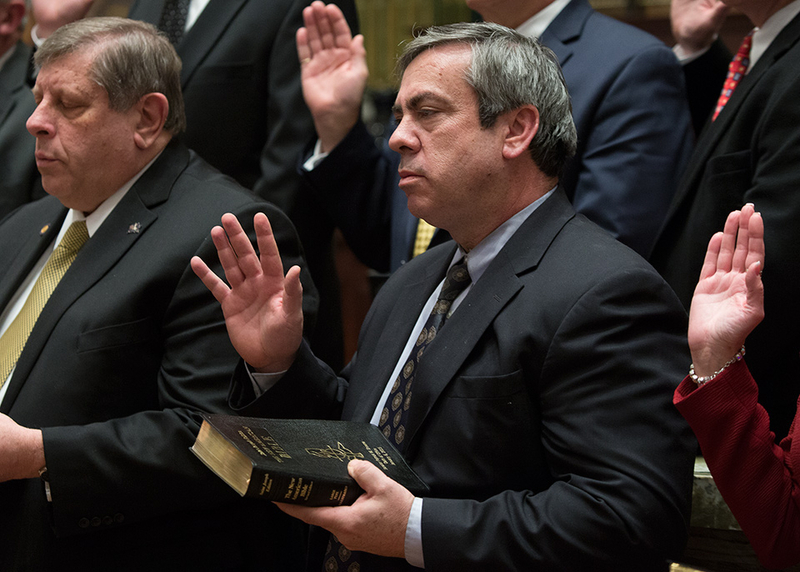 With his re-election, Senator Browne begins his fourth term in the Senate.